To help raise interest in the campaign, I decided to run a Kallakore Pin Giveaway, with entry details at the link! AND there’s over 3 weeks left, and a lot more stuff to be unlocked and added to orders… I’m really looking forward to wrapping this comic up with a bang, haha. I’m doing the thing I said I’d be doing and banging out as many updates as I can as fast as I can without sacrificing quality, so we’ll be doing that until the end of the comic. See you tomorrow! Sort of want the full pdf and Abby comics. Don’t really want bookmarks and can’t consider prints without seeing them first. Mostly just want my head to not be in such a mess that I spend ages trying to decide between a $20 option and a $30 option, while wondering if I even want to spend $20. As someone who has consisitently backed at the $80-100 hardcover + all extras tiers, Der-shing does NOT disappoint. Spend the extra $10, if you regret it there’s always eBay or trading. I can guarantee the prints are going to be rad, but if you’re not sure you can always look at the artist sites linked, everyone of the artists I invited are truly incredible in their own right. The prints are probably also going to be postcards too, just to keep it functional, so if you’re not a fan you can postmark them to your enemies haha. Looks stunning! My only question is will there be a way to buy the book after the Kickstarter? Sorry- I’m new to Kickstarter. Yes, but probably not until after I’ve fulfilled the Kickstarter orders, so it’s iffy if I’ll have them for the holidays or not. Safest bet is that they’ll be available in early 2019, and if you’d like one this year, backing KS is probably the way to go! That way you get a bunch of extra stuff too, which is always nice. OMG, a print from Tom Parkinson-Morgan? You two were my first and second nominees on this year’s Hugo ballot. IDK about spoiled, but probably a lot overemotional and unproductive. Yeah, “overemotional and unproductive” sounds more accurate to their personalities than spoiled. But children? Problems on both sides? Definitely. Man, Mike’s eye-fungus thing just keeps looking increasingly more uncomfortable. I can’t imagine what would happen if he were to accidentally fall on that side of his head or something. Do we even know if there’s still an eye under it? Bex should be embarrassed for trying to trying to body-shame Michael like that, what a bully! Poor Levi, I imagine he’s trying to play peacemaker right now. Is “mtchew” onomatopoeia for Bex sucking her teeth? If so I love that detail. Also I find Michael infinitely more unpleasant than Bex. it’s a common noise of disgust in a lot of cultures (US included), but it’s often used and spelled that way in Nigeria, haha. I think the closest relative for US comics is tch. The other noise/action you mentioned is also a thing, but I probably won’t be using in the comic since it’s text-based (KMT/ Kiss My Teeth). From the US but never heard of this sound effect/action before. Trying to make that dismissive “mtchew” sound with my lips, but keep ending up with a raspberry. Reads to me like a sneeze..
Spitting out in disgust and dismissiveness, possibly? 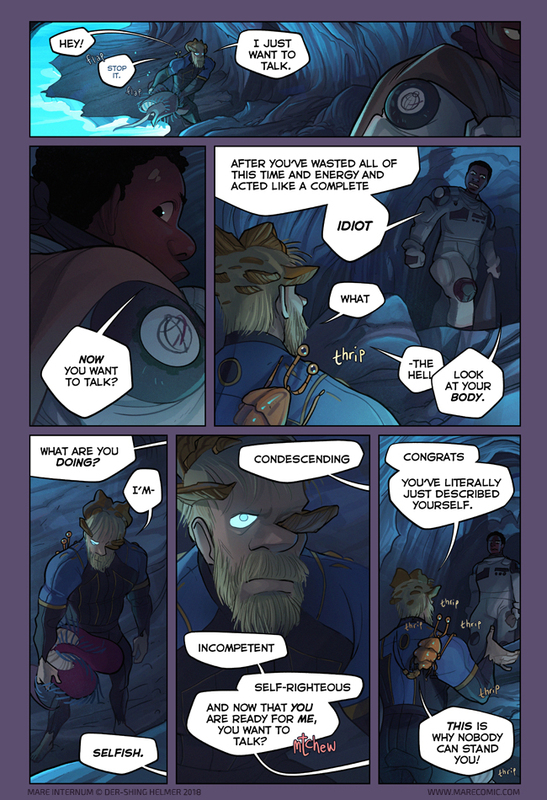 FYI, the text color of “Stop it” in the first panel is blue instead of black, probably not intentional. I think it’s just supposed to be slightly less black because he’s talking to thighfriend, and doing so slightly less loudly than how he’s talking to Bex. This conversation is going well. The metal hits the road, or however the saying goes. Reminds me of the staging of the argument between Suda and Rana in The Meek — one person standing on higher ground, supposedly talking from a place of superiority (moral integrity or practical reasoning). But it’s interesting that in this case, both of them are acting reprehensibly. I suppose it reflects more how the characters view each other (vs. how the readers are supposed to view the characters). Bex sees Michael as foolish and childish, Michael sees Bex as cold, superior, and aloof. I’m sad this comic will end soon but I can’t wait for my copy of the book. Thanks Der-Shing for all the thought and work you put into your comics! Remember how long it’s been since these two have bathed or had a hot meal. And each feels betrayed about ten times over. Next time you’re in a comparable fix, hope that your hostile coworkers are as upright, honest, well-behaved, and articulate–along with whatever human weaknesses they may have. Everyone knows it’s the highest order of effective dialogue. I guess they reenact Mike’s parents’ as well as Bex’ separations and divorces, only this time the child pushed to the side is a gold crab AI. Just checking – you did get my poem entry on Twitter, yes? I didn’t see it! Could you link it here? My Twitter has been super busy lately and I am definitely not catching everything. Is Mike supposed to have two glowing eyes in panel 1? This conversation looks like it’s going to be productive.